ADI’s new ADI Diff Amp Calculator™ is an updated, downloadable version of ADI’s popular ADIsimDiffAmp online design tool. The free, downloadable version of the tool reduces differential amplifier design calculations from hours to minutes. The new tool performs all the required differential amplifier calculations, which reduces design risks and further speeds time-to-market. 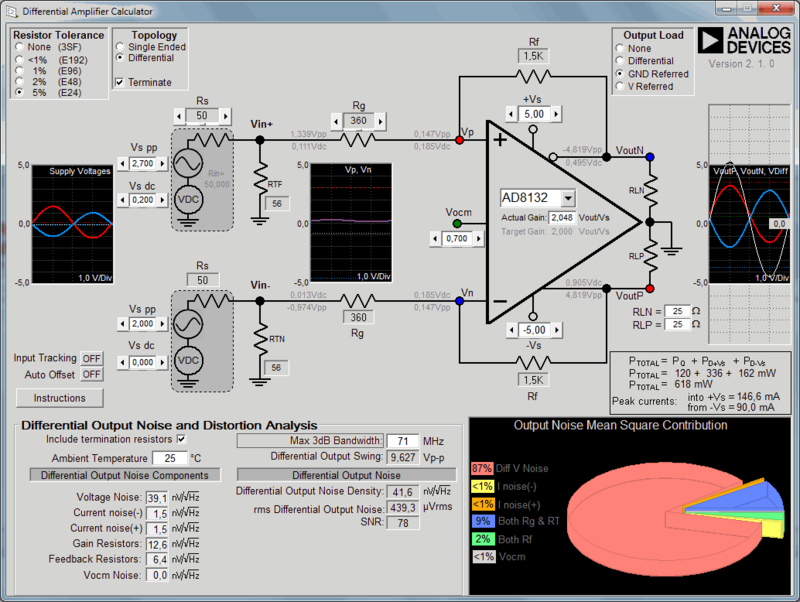 In addition, designers can quickly and easily calculate gain and component values of a differential amplifier circuit for terminated or un-terminated loads, determine the input/output and VOCM voltage range, as well as calculate noise and power dissipation. The tool also prevents you from making mistakes by alerting you when a device parameter has been exceeded. Automate time-consuming calculations required to determine optimal levels for gain, termination resistors, power dissipation, noise output and input common-mode voltage range. Create unlimited “what if” scenarios as data changes appear in real-time. Intuitive GUI features an interactive dashboard. Use a “point and click” method for quickly and easily adding and changing data. Supports ADI’s differential amplifier products including ADA4927-1/ADA4927-2, ADA4932-1/ADA4932-2, ADA4937-1/ADA4937-2, ADA4938-1/ADA4938-2, ADA4939-1/ADA4939-2, ADA4930-1/ADA4930-2, AD8132, AD8137, AD8138; and AD8139.